Is your data helping you brave the Big Data storm or letting you drown? Imagine going into a meeting with a top executive where you are asked to present data on how the company’s website is performing. The executive wants to use this data in a pitch to potential investors for your organization’s next round of funding, funds which are crucial to propel the company’s growth. However, when the executive asks you if the data you are handing him is reliable, you hesitate. Unfortunately, unless you do not have a solid, fully-implemented data quality assurance system, all you can offer is educated guesswork or excuses like the “margin of error” defense. Data quality assurance means having confidence in the accuracy of your digital data. Data quality assurance platforms offer automated data validation and web tag implementation verification for your digital marketing channels, so you can trust that the data you’re presenting to executives is accurate. Your strategic business decisions are only as good as the data that drives them. What if the data shows that a particular product page on your site is getting double the user traffic as your other product pages? Easy—you dedicate a large portion of your budget to promoting that product. But what if that page was only reporting such high numbers because there was a duplicate tag collecting the same user information for a second time, doubling your traffic data? The answer is data quality assurance. Data quality assurance solutions scan your digital properties, analyzing implementations to confirm that the sources of your data—the tags on your website, videos and apps—are deployed correctly and completely. Implementing a data quality assurance solution is an effective first step in your journey to quality data, but it doesn’t stop there. Websites are updated frequently, new tag technologies are integrated and old versions are sunsetted, and sometimes tags simply break or go missing—data quality is a process that must evolve and be maintained over time to accommodate and capture change. Having a data quality process that adapts to your website’s evolution ensures accurate data collection to more effectively drive your critical business decisions. Regular and consistent monitoring of your digital data and data quality processes are hallmarks of success. How many of your company’s decisions are based on unverified data? Research suggests 51% of digital marketers are not able to sufficiently identify the ROI from their web and mobile marketing technology stack. A large portion of your company’s marketing budget is spent collecting digital data. How can you be sure your data collection tools are functioning correctly and delivering their promised value? Data quality assurance tools validate that the data from your marketing investments is complete, correct and compliant, helping you to trust your marketing strategies and data. Wouldn’t it be wonderful if you could present your digital data with confidence? 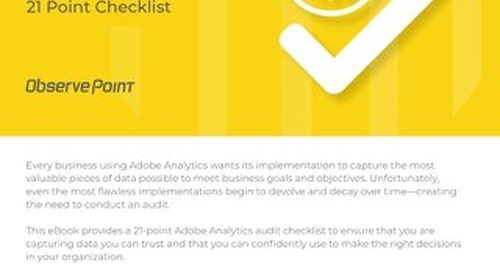 Begin the journey to superior data quality by performing a free website audit from ObservePoint’s Data Quality Assurance solution.